Restaurant-style Brussels sprouts, with their crisp, caramelized shells and tender insides, show up on many, many menus throughout NYC. Usually it’s hard to go wrong with this order, as long as they’re roasted, fried or otherwise prepared so they’re sweet – a far cry from the stinky steamed Brussels sprouts from the school cafeteria. Ilili, a Lebanese restaurant in Chelsea, makes a terrific Brussels sprouts dish with sweet and savory flavors, unlike any other I’ve tasted. Sweet fig jam sauce coats the sprouts, complementing tangy mint yogurt and crunchy walnuts. Stir mint leaves into yogurt, adding 1/2 teaspoon salt. Set aside. Add fig jam to a small pot over medium heat. Pour in 2 tablespoons water and cook until bubbling but not too thick, 2-3 minutes. If desired, purée sauce in a blender. 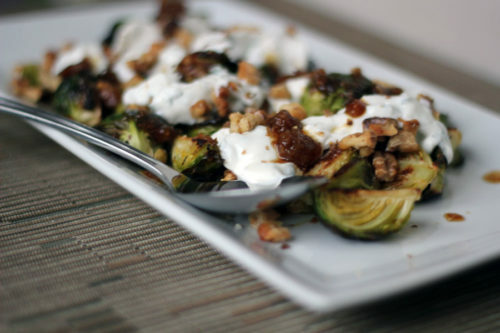 Serve Brussels sprouts drizzled with fig sauce, mint yogurt, and topped with crumbled walnuts. I have had this! Outstanding! I just had these brussel sprouts at Ilili and had told people that they were the best I've EVER had! So excited to see the recipe available! However, there's one thing missing.....There were halved grapes with the brussel sprouts also and the recipe didn't mention grapes! I'm going to add them!